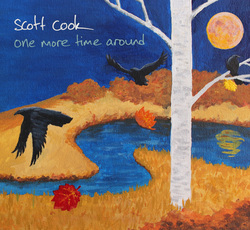 This is Scott Cook’s fourth solo album having previously worked in several Candian roots bands. His warm mellow vocals are perfectly suited to this slow moody folk music that has strong dashes of country and even a bluesiness that lifts the album above many of it’s peers. The trap that many others fall into is keeping the instrumentation repetitious, with very little variation so that one song pretty much blends into the next and is eventually lost in a sea of mellow saminess. Not so, this tremendous album. Whilst the instrumentation is of itself sparse, this is absolutely essential and enables Scott to paint his poetically lyrical pictures, but there is nothing boring about the varied instrumentation, in fact despite the sparsity, the listener is always left wondering what will come next. There are subtle changes in mood, tempo, instruments and lyrical content that, for me at least, produces echoes of the great Guy Clark and a few other singer songwriters of that quality. Scott Galloway, piano, Thon Golub, upright bass, Matt Blackie drums, Cam Boyce on fiddle and Jez Hellard plays guitar and harmony vocals. The album begins with Pass It Along a lovely slow moody ballad with nice tuneful acoustic guitar, banjo and bass on a song that uses the life of a guitar as an analogy for humanity as guardians of the world we live in, rather than owners. Certainly sentiments that we all know about but ones that are often ignored by most and nearly always by governments and big business, despite what they might say. This is followed by a song performed at pretty much the same pace but otherwise a world apart. This is Among The Trees on which Scott plays banjo and mbira, with Brian Mcmillan on guitar and Thom Golub double bass, on a song about lost dreams and lost innocence, done with incredible attention to the minute details that we can all relate to. When We’re Back Around has a lovely chugging banjo lead on an excellent, sparse, full of emotion song, with Jez Hellard on guitar and harmonies on a sad end of relationship love story that musically as well as lyrically evokes the wide open spaces of Scott’s Canadian homeland. You Don’t Find Out In The End is a beautifully reflective story with a nice chiming electric guitar courtesy of Jesse Dee plus an atmospheric shuffling snare on a song that says it’s not worth trying to work out what might be or might have been, you just have to plough on! Another philosophy that could improve things if adopted by us all. Final mention goes to New Grist a terrific song that has Cam Boyce on fiddle, with Jacquie B and Bramwell Park on harmony vocals, on a song that is stylistically reminiscent of Guy Clark and tells a tale that emphasizes the retention of old values is not necessarily a bad thing. It is a song that is so cleverly written and performed that it creates an almost idyllic atmosphere. Musically this tremendous album creates a lovely relaxed atmosphere that the listener can get lost in, whilst the lyrics emphasise some often ignored philosophies that might be highly idealistic but ultimately are ideals that we all need reminding of, perhaps more frequently than should be necessary. A terrific, often thought provoking album that works on several different levels at once.